Does life really begin at 40? Riaad Moosa tries to figure this out with his hilarious one-man show, Life Begins - a snapshot into his life as a 40-year-old, a father of three kids, husband, comedian, actor and with all the current cultural and political issues thrown in. 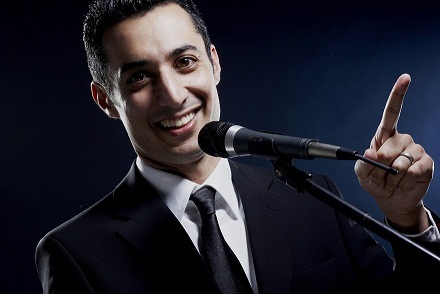 Following sold-out shows from Johannesburg to Cape Town and in between, Riaad Moosa invites the audience along to the next leg of his Life Begins tour which reaches Newcastle, Durban and Empangeni. “Even though I am now 40, in many ways, I feel like I’m still crawling and I’m looking back at my journey from being an aspirational doctor, coming from a relatively conservative Muslim background, where both my parents were doctors, and how I actually journeyed to becoming a stand-up comedian,” says Riaad. As an award-winning comedian, actor, writer and presenter, Riaad Moosa is one of South Africa’s most popular and acclaimed funny men and he happens to be a qualified medical doctor, too. Known as the “Comedy Doctor”, he certainly seems to have the remedy for the nation’s ills – a healthy dose of laughter, straight up – and hold the aspirin! “The show is very philosophical and existential. It involves the normal issues of getting older while at the same time experiencing, at a maturity where I’m supposed to be wise, a world that is completely turned on its head – with Trump, with Brexit; In South Africa, the ‘State Capture’, ‘Fees Must Fall’, ‘DOOM’. And it’s about how I negotiate all these things happening around me while trying to maintain a positive attitude. Through my comedic lens, I hope to put a different spin on that and hopefully my next 40 years will be lived with renewed vigour and excitement,” Moosa adds. Presented by Blu Blood, the show is rated PG for language. Tickets from R150 booked through Computicket online and various outlet stores.